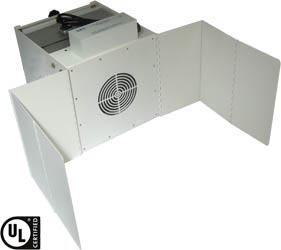 Chloroform vapor control with carbon filtration - Sentry Air Systems, Inc. The most common route of exposure to chloroform is via inhalation. Due to its sweet, nonirritating odor, some users may not think to use appropriate exposure protective measures. However once inhaled, multiple bodily organs are affected including the central nervous system, kidneys, liver, and heart. While little information is available in regards to a direct link to cancer, multiple research agencies list chloroform as a probable human carcinogen. As you can see in the below chart, many agencies recommend varying levels of exposure limits. The limits are primarily based on duration of exposure. TLV – Level to which it is believed a worker can be exposed day after day for a working lifetime without adverse health effects. STEL – The acceptable average exposure over a short period of time, as long as the TWA is not exceeded. It is important to note that the odor threshold of chloroform is approximately 85 ppm; that is 1.7 times greater than the established PEL of 50 ppm. An odor threshold is the lowest concentration of a certain odor compound that is perceivable by the human sense of smell. This means that if you are able to smell chloroform in the room air, you have surpassed the exposure limit guideline. 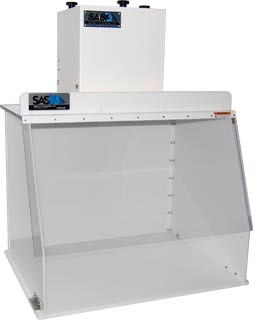 A source capture chemical fume extractor equipped with activated granule carbon filtration, is an excellent solution for chloroform vapor control. Granule carbon has an intricate porous structure that adsorbs hazardous chloroform molecules before they become airborne and potentially inhaled. The Agency for Toxic Substances and Disease Registry (ATSDR) developed a ToxFAQs sheet on chloroform, where it states that most of the chloroform in air eventually breaks down, but it is a slow process. This breakdown produces phosgene and hydrogen chloride, which are both toxic. To ensure chloroform vapors have plenty of time to breakdown and adsorb, a larger carbon filter is recommended. By increasing filter depth, more carbon granules are added whereby increasing the amount of surface area available for vapor capture and adsorption. 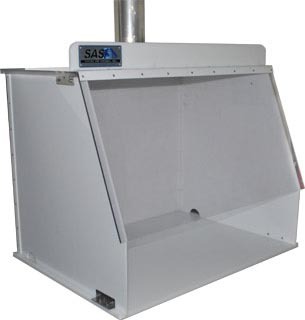 Sentry Air Systems offers a complete line of chemical fume extractors that come in a variety of sizes and configurations. 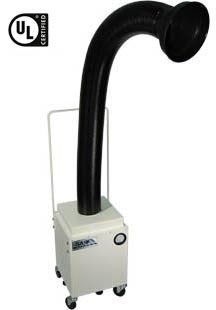 Equipped with a carbon pre-filter and activated granule carbon main filter, these systems protect the operator from the inhalation hazards of chloroform. Our Model 300 Series carbon filter media is appropriately sized to allow ample time for chloroform molecules to “bounce around” and adsorb into the granules; resulting in only highly cleansed air being recirculated back into the room. If you work with chloroform, or other chemicals, and seek an air filtration system, contact Sentry Air Systems at 800.799.4609, email sales@sentryair.com, visit our website, or fill out the feedback form below.